Riyad Mahrez is one of the players that has catalyzed Leicester City’s unexpected dominance in the Barclays Premier League this season. Let’s have a look at how the Algerian made the leap from French second division to the possible Premier League glory. Mahrez was born in the North of Paris to an Algerian father and a mother of Moroccan descent. Unfortunately, his father suffered a heart attack and passed away when Riyad was only 15 years of age. His dedication to the sport and willingness to work hard would take him across France and eventually help his Leicester squad to Premier League history. In 2004, Riyad Mahrez began his career in the youth club AAS Sarcelles; which was close to where the Algerian was born and had a high number of African based players already in the squad. The team played in the local Ligue de Paris. It was in 2009 that Mahrez made his first switch, when he joined the French football side Quimper, who were in the fourth tier of French football. His slender build made most clubs turn their backs to him, but he made up for it with his amazing ball skills. He made a total of 22 appearances for the French club, scoring 2 goals in the process. Mahrez was put in the Quimper youth squad in his first season at the club, before fighting his was to the first team squad. During his time at the club, he lived with Paul Pogba’s brother (Mathias Pogba) in an apartment in the center of town. “As a roommate, first of all I couldn’t get on with him because he was not tidy at all. I am very tidy, he used to eat and leave his plate. “I had to domesticate him, I had to put him on his feet. Then after two or three months everything was all right. Before that? No, it was not correct. “We had a bad diet. Bad, bad, bad, always eating steak and French fries. In 2010, Mahrez made his second switch and this time it was to French Club Le Havre after he had turned down offers from Paris Saint Germain as well as Marseille. He had been put into their reserve team shortly before he broke into the first team and managed to make a total of 60 appearances and scoring 6 goals along the way. During the late 2013 season, Mahrez had made a decision over his international career; he had opted to play for the Algerian National team even though he was eligible to represent the France National side – “I lived in France and grew up there, but my heart is more Algerian,” he stated. Mahrez later went on to represent the Algerian national side in the 2014 FIFA World Cup tournament as well as the 2015 Africa Cup of Nations. It was in 2014 that Riyad Mahrez was scouted by Leicester City man Steve Walsh, who was actually sent to scout Mahrez’s team mate Ryan Mendes. Steve became impressed with Mahrez’s technical skills with the ball and pushed the club to sign the young Algerian. Riyad Mahrez hadn’t known that Leicester City was a football club and instead assumed that they were a rugby club, it was only after he discovered that they were in fact a football club that his friends and family questioned the slender nature of Riyad. They had been worried that Riyad was too skinny for the rough nature of the English Premiership and instead would have preferred that he moved to a Spanish club. Eventually, Riyad Mahrez signed for the Championship side Leicester City for a transfer fee rumored to be around £400,000, despite fear from his family and friends. Mahrez made his professional debut for Leicester City on the 25th of January, 2014. Nigel Pearson deployed the elegant and slender bodied player on the wings; he was effective during counter attacks as well as a scorer of crucial goals. Mahrez helped Leicester get promoted from the Championship and even win the Championship title, which ensured Leicester City’s leap to the Barclays Premier League. The following year saw Leicester struggle during the beginning of the season and fears of relegation had begun to swing through the Leicester camps. It was only in the last nine games of the season that Leicester managed to escape relegation back to the Championship division, finishing 14th in the table. Mahrez managed to play a total of 30 matches in the Premier League and finished off the season with four goals and three assists. 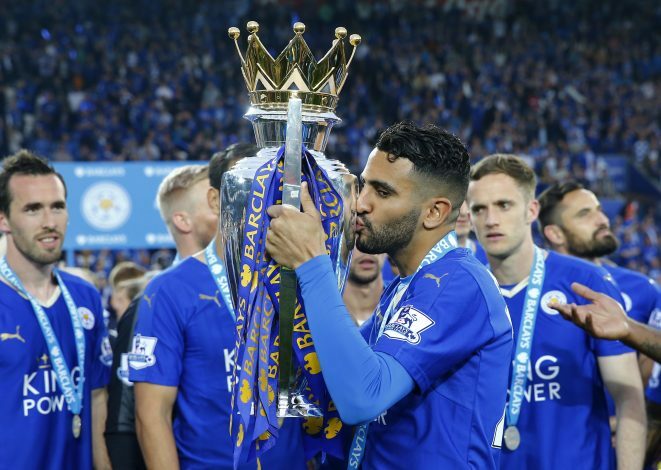 During the summer of 2015, new boss Claudio Ranieri offered Mahrez a new 4 year contract, which the Algerian signed; sparking the beginning of the club’s surprising title charge. Riyad managed to score 10 goals in the first half of the 2015-16 Premier League season; coupled with Jamie Vardy’s brilliant goal scoring streak and amazing performances from the whole squad, Leicester had catapulted to the top of the Premier League table. As a result of his superb performances, Mahrez’s transfer value had risen from its initial value of £4.5 million to a staggering £30 million. He is currently ranked amongst the top 50 most valuable players in Europe. His incredible performances have bagged him a total of 17 goals this season alone, as well as a total of 11 assists; ranking him above some of the Premier League’s finest such as Mesut Ozil (18 assists and 6 goals). Riyad’s heroics were awarded in late April 2016 when he was named in the Professional Footballer’s Association Team of the year, as well as becoming the first ever African player to with the PFA Players’ Player of the Year award; dubbing him the best performer of this 2015-16 season. Mahrez has become such a big figure in football that his fans even travel from as far as Belgium to the very barbershop (in France) where the Leicester star cuts his hair, in order to have the same hairstyle as Riyad. A really heart-warming story of a kid who was dubbed too skinny for the English game by many people, but made the journey form French second division to English Premier League history. Not bad for the young Algerian, seems like there will be plenty more years ahead of him.